Cheese String recipe by Marium at DesiRecipes.com. Place cheese curd in a saucepan and add a pinch of mahleb and salt and a sprinkling of black seeds. Heat on low until the cheese is melted thoroughly. Remove from heat and drain any excess water. Pick up the hot cheese in a lump, and make a hole in the center to resemble a doughnut. With both hands, stretch and turn the cheese to form a large loop. Double the strand of cheese, making two strands of cheese of even length. Repeat, stretching and looping; (the more you stretch the stringier the cheese becomes). Repeat the stretching several times. Twist the ends in opposite directions and intertwine rope into a braid. Place one end through the loop of the other to lock it. Set the cheese aside to dry thoroughly. Wrap it in plastic wrap and refrigerate or freeze it. 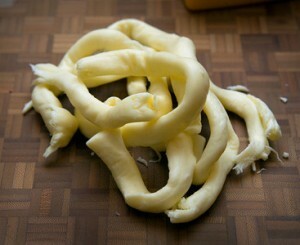 To serve, open braid, cut one loop and pull the cheese apart into thin strands.